It’s a weekend night and you’ve been partying up with your friends at the local bar, but now last call has finally come to light – with most folks making the mass exodus to the exit door to head home. If you’re somehow unsure about your current state, the Alcohoot can deliver a sobering answer that’ll tell you exactly your blood alcohol level. Yes folks, this is a compact, travel-friendly accessory that connects to your smartphone, so you can test yourself and your friends. 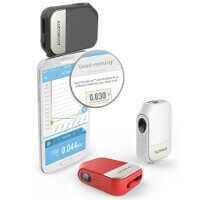 At the Luxury Technology Show held in New York City, we got a quick look at this smartphone breathalyzer. Attached to either an Android or iOS device, the Alcohoot connects via the 3.5mm headphones jack to measure your blood alcohol level. Essentially, all that’s necessary to get the recording is to launch the app, and then blow into the mouthpiece on the Alcohoot. From there, it takes only a few seconds for it to determine your blood alcohol level – one that we’re told as utilizing “police-grade” technology. Who knows exactly how it lives up to that claim, but hey, it’s better than doing a self-assessment of some sort. Now, as much as it’d by funny for the Alcohoot to tell you to go home because you’re drunk, there’s a responsible aspect to it – in the way that the algorithms used by the app help to provide you with actionable steps based on your habits and trends. In addition, we’re told that Alcohoot can even help you to discover your personal limits, so that you can make responsible decisions in the future. Indeed, this accessory certainly is most useful in specific circumstances, but we feel that it would’ve been beneficial for it to be wireless. In fact, maybe have a Bluetooth model in place of this wired one that connects to a phone’s 3.5mm headset jack? Despite that, the $99.99 price tag attached to the Alcohoot is tough to say if it’s a must-buy. It’s still pricey taking into factor that it’s a specialized product, but we can only guess it’s a lot cheaper than what law enforcement uses in the field. Why would a Bluetooth version be better? If imma be drunk, I'm not gonna want to be trying to connect a Bluetooth device haha.